As of Windows 10 1809, the default USB removal policy is now “quick removal” mode. This is probably a good move for most people. 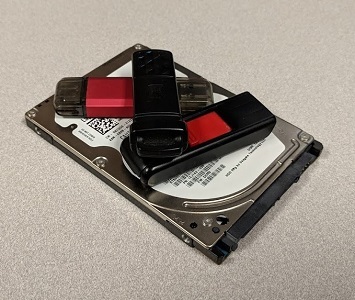 But what if you are using big files or do regular backups to a USB drive or external hard drive connected by USB? Could this cause issues? I run some virtual machines off of an external hard drive dock. So better performance is something I wanted to look into. It only takes 3 seconds to eject the device at the end of the day anyway so that is not that bad. 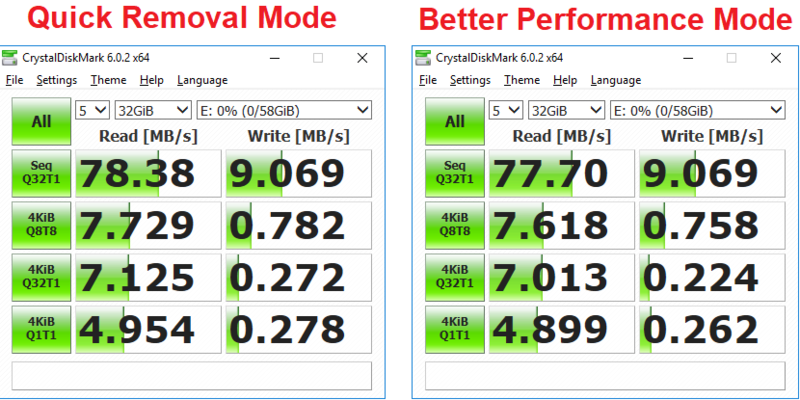 In the original Better performance mode Windows would manage data transfers and cache data. This could lead to faster response times and transfer speeds. But if a drive gets disconnected while data was still in the cache it could cause corruption. In quick removal mode, all the windows management stuff is turned off. This means that as long as data is not actively being written to the drive it can disconnect safely. But the drive may be slower. This is because Windows has to read/write every time it needs info from the disk. 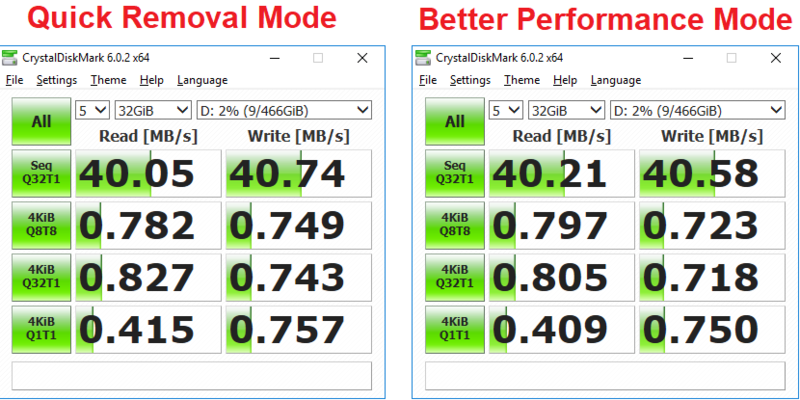 I ran some benchmark test on my USB hard drive dock using a 32GB file size. The difference between the 2 modes is so small I do not think it even matters for 99% of people. The difference is so insignificant it is possible that a background task on my computer could be interfering and making one look better over the other. 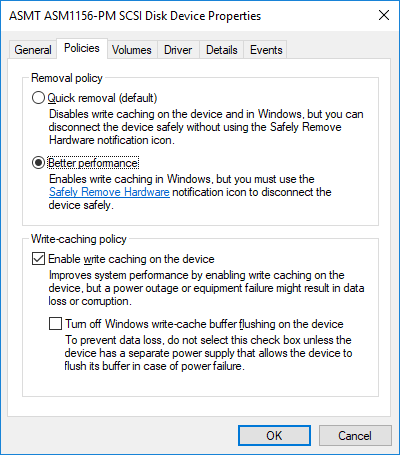 It is also possible this benchmark I used already attempts to bypass the windows write cache. But that is a wild theory and I have nothing to back that up. Test on a USB hard drive dock. There may still be a case to change this depending on the device or job you are trying to do. 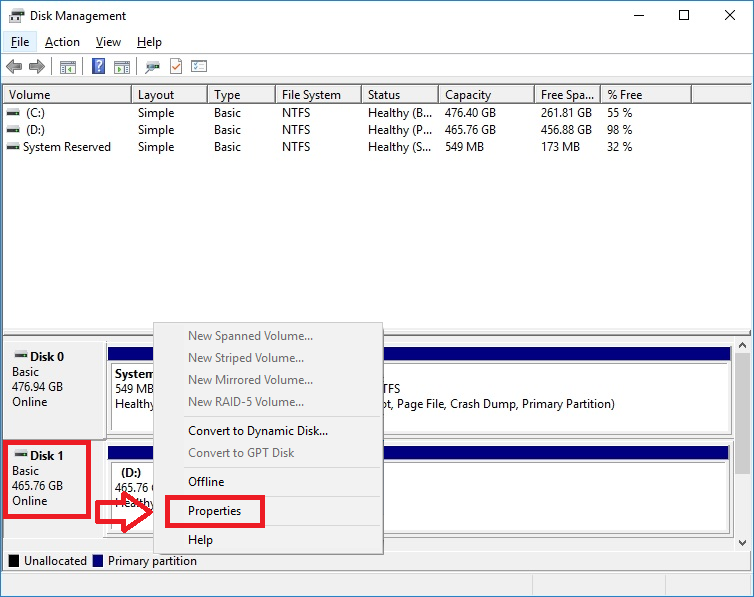 Windows lets you switch the mode in Disk Management. The easiest way to get to that is to type “Disk Management” in the start menu of Windows 10 and hit enter. Then right-click the disk you want to change and go to properties. In my case it is the D drive that is on disk 1. Next, in the properties window go to the policies tab and you will see the options to set the USB mode for the disk. Depending on the device Windows may ask you to restart for the changes in hardware settings to take effect. These are good options to have but the performance is almost the same. I do not see any real reason why most people should worry about this setting. The quick removal is probably better for most cases and I can understand why Microsoft made it the default.